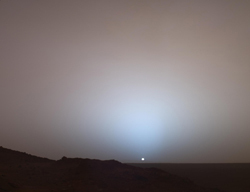 On May 19th, 2005, NASA's Mars Exploration Rover Spirit captured this stunning view as the Sun sank below the rim of Gusev crater on Mars. The event will be streamed live on the Web at <a href="http://ustream.tv/NASAJPL">http://ustream.tv/NASAJPL</a> . The discussion will also be webcast live at http://ustream.tv/NASAJPL . For NASA TV streaming video, downlink and scheduling information, vis it http://www.nasa.gov/nasatv . JPL manages the Spirit and Opportunity rovers for NASA's Science Mission Directorate in Washington. 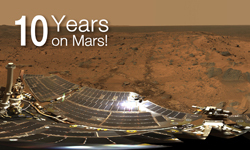 For more information on the rovers and the Mars Exploration Program, visit http://www.nasa.gov/mars and http://mars.nasa.gov .